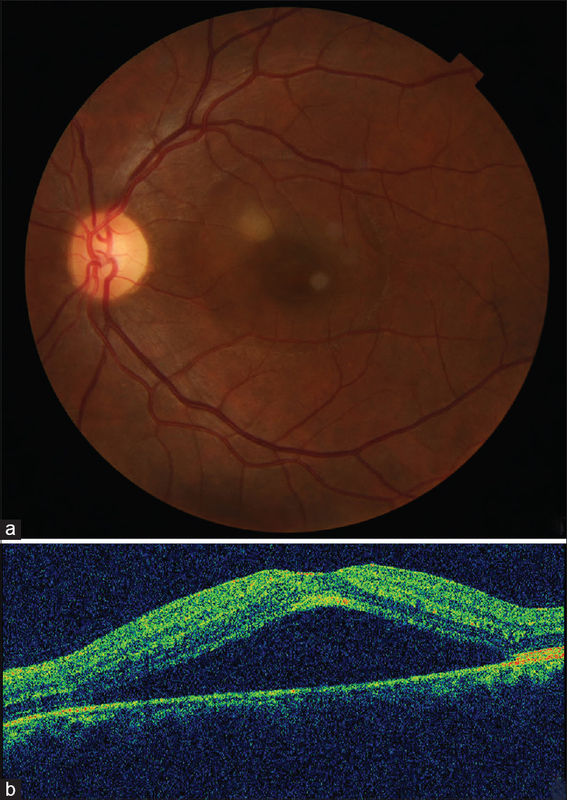 A 30-year-old insomniac, an off-label user of quetiapine, presented with blurring of central vision, eventually diagnosed as central serous chorioretinopathy. A potential association was suspected based on the drug's actions on the autonomic nervous system. He showed improvement on drug withdrawal; then he unwittingly resumed quetiapine and had a recurrence. Possible underlying mechanisms that include alteration in choroidal perfusion through serotonin and dopamine receptors are discussed. 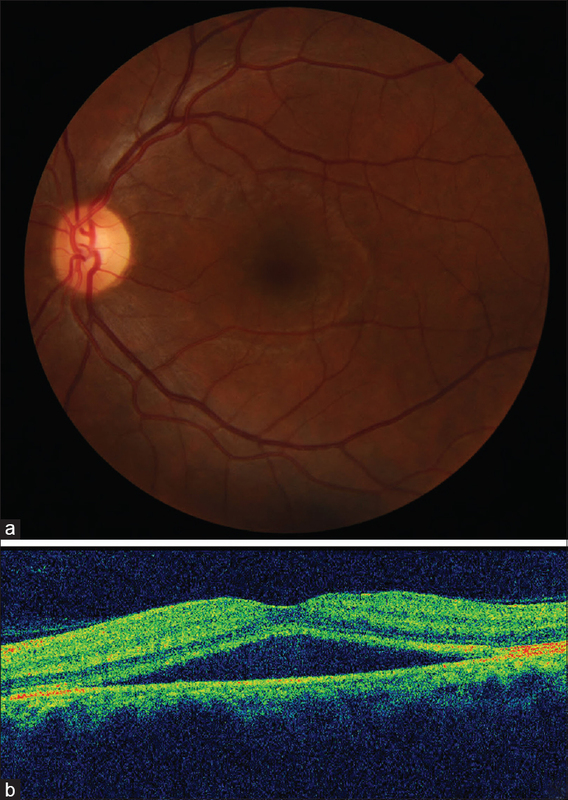 Although retinal vein occlusions and pigment epithelial detachment have been described with quetiapine, to the author's knowledge, this is the first case report of quetiapine-associated central serous chorioretinopathy. Central serous chorioretinopathy (CSCR) is characterized by subretinal accumulation of fluid leading to central blurring of vision and metamorphopsia. Apart from corticosteroids and sympathomimetic agents, phosphodiesterase inhibitors and mefloquine are other drugs associated with the condition.,, Quetiapine is an atypical antipsychotic drug with affinity for multiple receptors including those for dopamine and serotonin. Ocular adverse effects include blurring of vision, retinal vein occlusion, oculogyric crisis, ocular pain, transient myopia, narrow angle, halos around lights, hallucinations as in Charles–Bonnet syndrome, and photopsiae.,, A case of CSCR associated with quetiapine is presented. He had a marked regression on drug withdrawal and recurrence on inadvertent re-challenge. A 30-year-old man presented with acute diminution of vision in the left eye without metamorphopsia. His previous medical history included insomnia, gastroesophageal reflux, hemorrhoids, pharyngitis, and seborrheic dermatitis. Dermatitis was treated with mometasone furoate 0.1% ointment for 5 days 10 months ago without any visual symptoms. For insomnia, he used quetiapine (Seroquel 200 mg) off label for an unspecified duration. He had no other addictions. His best corrected visual acuity (BCVA) was 6/6 and 6/15. Intraocular pressure was 13 and 12 mmHg in right and left eye, respectively. On fundus examination, a large neurosensory elevation of approximately 3-disc diameters in size involving the fovea was seen in the left eye resembling CSCR with a distinct pale area. Optical coherence tomography (OCT) showed undulation of the retinal pigment epithelium at the nasal parafoveal area and subretinal fluid [Figure 1]a and [Figure 1]b. He declined to undergo fluorescein angiography apprehending hypersensitivity. Patient was asked to discontinue quetiapine. Nine days later, there was a marked reduction in the serous elevation and the extent of the lesion; the pale lesion within the dome had disappeared [Figure 2]a and [Figure 2]b. His BCVA improved to 6/9. He was then lost to follow-up only to return 10 months later, with 1 week history of recurrent blurring of vision in left eye with distortion (BCVA 6/18); slit lamp biomicroscopy revealed two distinct areas of serous elevations – one corresponding to the initial location, and a fresh one along inferotemporal arcade approximately 1.5-disc diameter in size, with a distinct pale-colored area. This time he agreed to undergo fluorescein angiography. A single area of leak was noticed corresponding to the pale area within the fresh lesion; it enhanced in the late phase as an ink blot [Figure 3]a, [Figure 3]b, [Figure 3]c. He admitted resuming quetiapine 3 weeks earlier. He was advised to discontinue quetiapine. A medical advisory against use of quetiapine and steroids was added in his records. The patient did not revert; nevertheless, informed that he has been asymptomatic 25 months after the recurrence. Prima facie, this CSCR patient had multiple risk factors identified by a CSCR-specific questionnaire developed in view of high prevalence. Further, the natural history of CSCR can be waxing and waning. However, a reasonable temporal sequence to quetiapine intake, amelioration of serous elevation on day 9 after withdrawal, and recurrence on inadvertent re-challenge after a 10 month remission with a Naranjo algorithm score of 5, implies a probable association. Classical association with stress, steroids, and activation of hypothalamus–pituitary–adrenal axis aside, recent insights suggest that psychobiological influences from the prefrontal cortex govern the terminal events at the levels of choriocapillary endothelium, retinal pigment epithelium/Bruch's membrane interface leading to CSCR via dopamine, and serotonin pathways., Angiographic evidences suggest that CSCR arises when increased hydrostatic pressure in the choroid associated with choroidal hyperpermeability reverses the normal physiologic flow of fluid from the retina to the choroid. Quetiapine operates through multiple neurotransmitter receptors including serotonin (5-HT1A, 5-HT2A, 5-HT2C), dopamine (D1 like, i.e. D1 and D5 and D2 like, i.e. D2, D3, and D4), histamine (H1), and adrenergic (α1 and α2) receptors. D1-like receptors are excitatory heteroreceptors located on nondopamine neurons, whereas D2-like receptors are inhibitory, presynaptic autoreceptors. Serotonin receptors modulate emotions (5-HT1A) in the limbic system, as well as regulate release of serotonin from presynaptic terminals and other neurotransmitters such as acetylcholine in the hippocampus and dopamine in the prefrontal cortex (5-HT1B and 5-HT1D). Reduced blood serotonin level has been demonstrated in chronic CSCR compared to age-matched controls. Indeed, mammalian choroid with its rich distribution of dopamine receptors has a network of neurons called intrinsic choroidal neurons and nonvascular smooth muscles beneath the Bruch's membrane that regulates the choroidal thickness and vascular flow through autonomic innervations. In this case, we did not have access to enhanced depth imaging or swept source OCT to assess the possibility of pachychoroid. However, a host factor such as pachychoroid and environmental triggers such as steroids/quetiapine may not be mutually exclusive given the previous reports of concurrent presence or progression of one or more disorders of pachychoroid spectrum. Although this is the first such association to the author's knowledge, a more circumspect, preventive ophthalmological approach to explore possible pharmacological triggers is strongly recommended especially with current off label use of psychobiological drugs., Apparently, quetiapine modulated choroidal perfusion and thickness through dopamine and serotonin receptors in autonomic nervous system. Gordon-Bennett P, Rimmer T. Central serous chorioretinopathy following oral tadalafil. Eye (Lond) 2012;26:168-9. Jain M, Nevin RL, Ahmed I. Mefloquine-associated dizziness, diplopia, and central serous chorioretinopathy: A case report. J Med Case Rep 2016;10:305. Tittl MK, Spaide RF, Wong D, Pilotto E, Yannuzi LA, Fisher YL, et al. 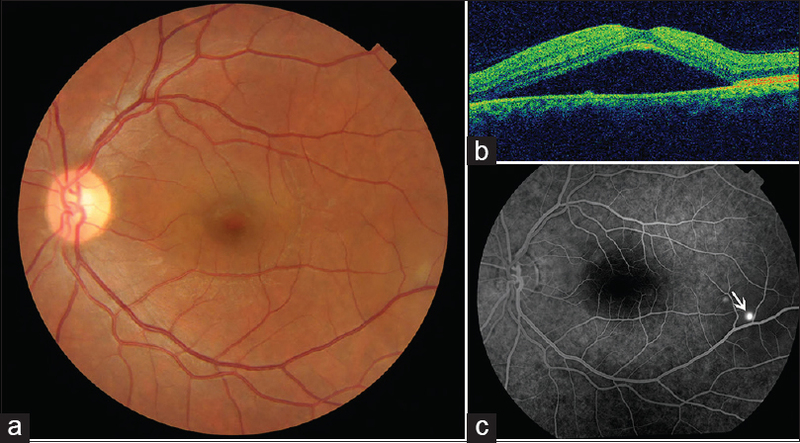 Systemic findings associated with central serous chorioretinopathy. Am J Ophthalmol 1999;128:63-8. Nair AG, Nair AG, George RJ, Biswas J, Gandhi RA. Aripiprazole induced transient myopia: A case report and review of literature. Cutan Ocul Toxicol 2012;31:74-6. Yong KC, Kah TA, Ghee YT, Siang LC, Bastion ML. Branch retinal vein occlusion associated with quetiapine fumarate. BMC Ophthalmol 2011;11:24. Taki K, Kida T, Fukumoto M, Sato T, Oku H, Ikeda T. Central retinal vein occlusion in 2 patients using antipsychotic drugs. Case Rep Ophthalmol 2017;8:410-5. Bujarborua D, Borooah S, Dhillon B. Getting serious with retinopathy: Approaching an integrated hypothesis for central serous chorioretinopathy. Med Hypotheses 2013;81:268-73. McDougal DH, Gamlin PD. Autonomic control of the eye. Compr Physiol 2015;5:439-73. Sakai T, Tsuneoka H. Reduced blood serotonin levels in chronic central serous chorioretinopathy. Ophthalmol Retina 2017;1:145-8. Reitsamer HA, Zawinka C, Branka M. Dopaminergic vasodilation in the choroidal circulation by d1/d5 receptor activation. Invest Ophthalmol Vis Sci 2004;45:900-5. Berrones D , Salcedo-Villanueva G, Morales-Cantón V, Velez-Montoya R. Changes in retinal and choroidal vascular blood flow after oral sildenafil: An optical coherence tomography angiography study. J Ophthalmol 2017;2017:7174540.